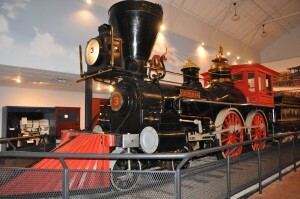 The General, famed for the daring theft of it during the Civil War, resides now in the Southern Museum of Civil War and Locomotive History, Kennesaw, Georgia. It has been one hundred fifty one years and a handful of days since the adventure that elevated The General, a Civil War era engine, from obscurity to a place in history. 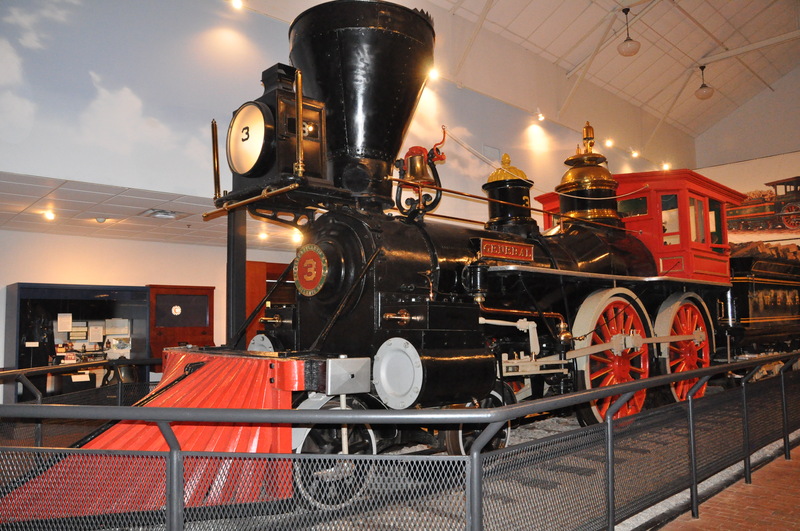 If it had not been for James J. Andrews, a civilian scout for the North, and his audacious plan, I wouldn’t have bothered to shoot the above photo, and it is unlikely that the Southern Museum of Civil War and Locomotive History would have preserved the handsome Confederate relic. One of the main strategies used by both Federals and Rebels during the Civil War was the disruption of transportation, primarily by destroying railroads, bridges and tunnels. A major railway route lay between Atlanta and Chattanooga. Destroy or obstruct the single line of rails, and the Union would have seriously compromised the security of Chattanooga. In a daring raid, termed the most “Dramatic in the Civil War,” under Andrews’ direction, twenty-two volunteers from the Union army and two civilians stole the train, The General, while its passengers and crew were stopped for breakfast and refueling at Big Shanty, (now Kennesaw) Georgia. Although the initial theft went off without a hitch, after that, poor Andrews and his crew couldn’t catch a break. First of all, unfortunately for Andrews and his men, the General’s conductor was William Allan Fuller, a tenacious man who didn’t know when or how to give up. Then Andrews had to repeatedly stop and let southbound trains go by on the single track connection between Atlanta and Chattanooga, slowing him enough that Fuller even without good transportation kept gaining on him. At Kingston, a sectional train pre-empted his travel, holding him there while several trains passed until the angry Fuller and the soldiers he’d collected during the chase came very close to catching him. After a breath-taking chase, first on foot, then by handcar, and finally on board another couple of trains, Fuller comandeered The Texas, running it in reverse since it was headed south. After a thundering race through the tunnel at Tunnel Hill, the train rustlers were caught just south of Chattanooga. Several of the men were hanged immediately after the capture, some were taken to various prisons, tried and later hanged. A few escaped and made their way back north to Union lines. Andrews, the audacious mastermind, was one of the men hanged. The very first Medals of Honor were given to some of the volunteers for that effort. At least two movies, THE GENERAL, a Buster Keaton silent comedy, and THE GREAT LOCOMOTIVE CHASE, a Walt Disney movie, were based on the incident. Several later books were written about this event, including Wild Train: The Story of the Andrews Raiders, by Charles O’Neill, (Random House, 1959), long considered one of the most authoritative accounts of the Raid..
W. D., my husband’s great grandfather and the subject of my book, GOING TO SEE THE ELEPHANT, A CIVIL WAR MEMOIR, was still working his farm in the northwestern corner of Missouri when The Great Chase happened on April 12, 1862. I can picture him going about his work debating with himself in light of his family responsibilities, whether he needed to get into this conflict that was tearing his country apart. He must have read accounts of The Chase with a mix of amusement, astonishment and pride. Whether the Great Locomotive Chase influenced his decision to join the Federal forces, there’s no way to know, but by August of that year, he had signed the enlistment papers and set off to be a soldier.